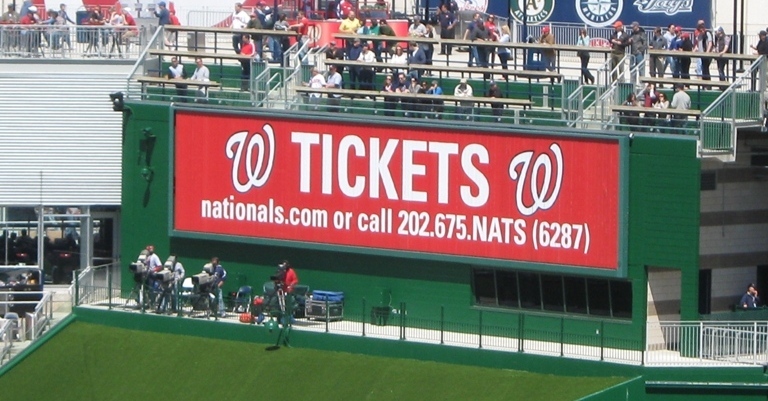 There are plenty of generally easy ways to get to Nationals Park; you can drive and park of course, but the traffic is rough and parking rates are Fenway-level, so here are a couple of ways to avoid both. You know exactly how long you have to stand around. Get To Nationals Park, Tip #1: Use The Metro. The D.C. Metrorail system is one of the most highly regarded in the country. The trains are clean and comfortable, service is efficient and frequent, and the system covers most anything worth reaching in D.C. proper. If you’re staying in D.C. or live there, it should not be difficult at all to get anywhere in two train rides. Even from outside the city it’s not hard to find a park-and-ride Metro station. Nearly all of the stations close to the I-95/495 beltway are park-and-rides, where you can park inexpensively and for free on weekends. There are some you might want to avoid for different reasons, but the majority of them are easy in and out. Would be nice if you could park here. Nationals Park is just steps away from the Navy Yard Station on the Metro’s green line. There are two entrances/exits to the station; coming from the train there are signs clearly showing the way. It’s so idiot-proof even a congressman could use it. Upon emerging from the Navy Yard Station, Nationals Park’s impressive center field entrance is immediately in view—you can see the seats inside the open-air facility—and you pass by numerous food vendors on Half Street hawking hotdogs, water, peanuts and any other snack that you can bring into the ballpark. It’s not terribly difficult to drive to Nationals Park, and there is a fair amount of parking. But it is still driving in the city, and not only might you get frustrated with traffic, but you will pay a nice chunk of change to park anywhere that is less than a mile walk to the park. Coming from a park-and-ride or from another station in the city, you’re spared all of that. And the station platforms are pretty cool looking too. Tell your friends! And it’s Ladies Night! Get To Nationals Park, Tip #2: The Ballpark Bus. The Ballpark Bus was hatched by one Brian Bowman, a Nationals fan who doesn’t live close enough to a WMATA Metro station to make taking the train convenient. So rather than complain to the Metro people or the Nationals, Bowman came up with his own solution for Nats fans that share his dilemma. The Ballpark Bus runs from Ashburn and Reston, two areas west of the District that are not covered by the Metro’s tentacles. Bowman worked out deals with local taverns and restaurants for the pickup areas, and some of these establishments will offer food specials with the ride…winners all around. It’s affordable too…cheaper than driving and especially parking. Just reserve a spot ahead of time, and if the demand is high enough the bus will roll; and if not, you won’t be charged. What I love about the Ballpark Bus is that it’s a private enterprise—“mass transit on demand” as they call it. I understand that cities require taxpayer-funded ways for people to get to the ballpark and I‘m not knocking it—especially in Washington, where local taxpayers footed the entire bill for the place. The city has to recoup its investment and no one will go if it’s too difficult to get there. But the Ballpark Bus is an independent solution, to a problem that many Nats fans still have.